Mary Somerville, the "Queen of Nineteenth-Century Science"
I have spent a great deal of time in many posts on this blog bitching about the Encyclopedia Britannica and its woeful lack of inclusion when it comes to women. So I do have to begin by saying that the Britannica in its new online form has an extended entry on Mary Somerville. The daughter of William George Fairfax and Margaret Charters, his second wife, Mary Fairfax failed to receive much in the way of an education during her earliest years. While her brothers were of course given the kind academic preparation deemed necessary for boys, the young Mary was taught to read, by her mother, but not to write. She also learned to say her prayers. As Mary would later write, she was "allowed to grow up a wild creature." After her father, a vice admiral, returned from sea and decided his daughter was something of a "savage" (which seems fair, given her own description of herself), the ten-year-old Mary was sent to Miss Primrose's Academy for Girls in Musselburgh. After a year at this expensive school, she returned home, able to read and write, though still not very well, capable of simple arithmetic, and knowing some French. She would describe her experience of leaving the school as feeling "like a wild animal escaped out of a cage." Unfortunately her efforts at educating herself were not encouraged--such occupations were not ladylike. To direct her energies more appropriately, she was sent to a school in Burntisland where she she could improve her needlework. The family began spending winters in Edinburgh when Mary was thirteen, and she participated fully in the social life of the city; as she described this period of her life, she enjoyed the "parties, visits, balls, theatres, concerts, and innocent flirtations," But she also took instruction in writing and painting. And having encountered some mysterious-looking symbols in a woman's magazine, she began studying algebra--although, as she also noted, her father was afraid that "the strain of abstract thought would injure the tender female frame." In 1804, when she was twenty-four, Mary Fairfax married a cousin, Samuel Grieg. She quickly gave birth to two children. Her husband was not a supporter of his wife's less "natural" activities--as she described him, he "possessed in full the prejudice against learned women which was common at that time." After Grieg's early death in 1807, Mary Fairfax Grieg returned to Scotland. With the financial inheritance she received as Grieg's widow, she was able to dedicate herself to her studies, this time with the support of several significant intellectuals, including John Playfair, a geologist and mathematician at the University of Edinburgh, and William Wallace (Playfair's former pupil), another noted mathematician. In their correspondence, they discussed the mathematical problems set in Thomas Leybourn's philosophical journal, Mathematical Repository. For her solution to one of these problems, she received a silver medal from the editors of the journal. During this period and with Wallace's encouragement, she read Isaac Newton's Principia and the Traité de mécanique céleste (Celestial Mechanics) by the French mathematician and astronomer Pierre-Simon Laplace. In 1812, she married again, to another cousin, William Somerville, who proved to be much more supportive of his wife's intellectual career. The couple moved to London in In 1816, where Mary Somerville attended lectures at the Royal Institute. There she met Caroline Herschel, Annabella Milbanke, lady Byron, and Lady Byron's daughter, Ada Lovelace. In addition to giving birth to four children, she also began her remarkable scientific career. In 1825, she experimented with magnetism, presenting a paper on her experiments the next year, in 1826, to the Royal Society. Her work, "The Magnetic Properties of the Violet Rays of the Solar Spectrum," was then published in the Society's Philosophical Transactions. In 1827, she was encouraged to produce versions of Newton's Principia and Laplace's Mecanique for the general reading audience. The result, The Mechanism of the Heavens, published in 1831, proved to be very successful--and resulted in a portrait bust of her being commissioned for and displayed by the Royal Society. During the years 1832 and 1833, while traveling in Europe, she completed The Connection of the Physical Sciences, published in 1834. The next year, along with Caroline Herschel, she was elected to the Royal Astronomical Society, the first women to receive such an honor. She garnered many such recognitions: in 1834, she was elected to honorary membership in the Société de Physique et d'Histoire Naturelle de Genève and, in the same year, to the Royal Irish Academy. She was awarded a civil pension of £200 per annum, increased to £300 in 1837. In an effort to improve William Somerville's health, the family relocated to Italy in 1832, where Mary Somerville completed her two-volume Physical Geography, published in 1848. Its publication produced another round of honors: she was elected to the American Geographical and Statistical Society in 1857, the Italian Geographical Society in 1870, and, in the same year, she received the Victoria Gold Medal of the Royal Geographical Society. After the death of her husband, Somerville remained in Italy, completing two more works, her last scientific book, Molecular and Microscopic Science (1869) and her autobiography, Personal Recollections, from Early Life to Old Age, edited and published after her death by her daughter in 1873. 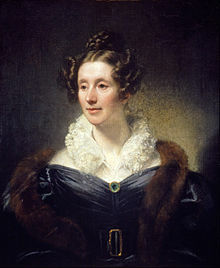 Mary Somerville died in Naples at the age of ninety two, on 29 November 1872. Noting her death, The London Post proclaimed her the "queen of nineteenth-century science." One of the most recognizable honors paid to Mary Somerville was in 1879, years after her death. In that year, and in recognition of Mary Somerville's support for women's education, Somerville College in Oxford was named after her. 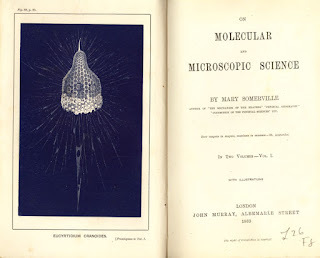 Today you can access all of Mary Somerville's work through the Internet Archive or Project Gutenberg. You might also enjoy Robyn Arianrhod's Seduced by Logic: Émilie Du Châtelet, Mary Somerville and the Newtonian Revolution, which will also introduce you to another important female intellectual, Émilie Du Châtelet (1706-49).